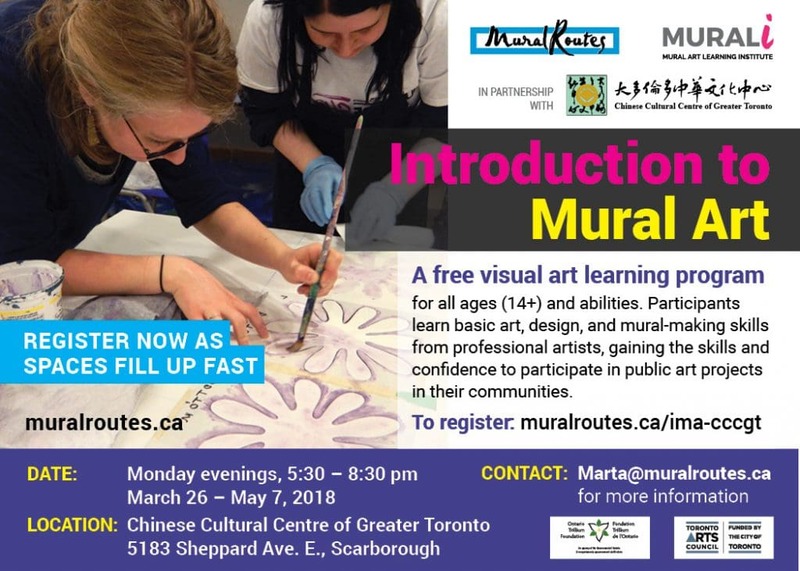 Mural Routes is excited to partner with the Chinese Cultural Centre of Greater Toronto for our next Introduction to Mural Art series of workshops. Introduction to Mural Art is a free visual art learning program for all skills levels. Professional artists lead a series of six sessions connecting basic art and design techniques to the practical skills of mural making, empowering community members to participate in public wall art projects. Must be at least 14 years old to participate. Workshops include: drawing and painting techniques, colour theory, design challenges, stencil design and printing, enlarging techniques, and large-scale collaborative design. While the program focuses on mural techniques, participants will not be working on a wall mural but on large-scale panels. Who: Ages 14+ all skill levels welcome to attend. Registration: Participation is fully subsidized, but participants are expected to commit to all six sessions. To register simply fill out and submit the form below. Please note: Spaces fill up fast, so register now! Contact: marta@muralroutes.ca for more information. Introduction to Mural Art is part of the Mural Art Learning Institute (MURALI), a continuum of training programs in all aspects of mural-making. MURALI is generously supported by the Ontario Trillium Foundation.